Multifidus muscle in this picture is paralleling the spine only on the right for educational purposes. (1) Muscle spindles respond to stretch, and provide important cues to the central nervous system for control of muscle tone and position sense. (2) Afferent spindle discharge in antigravity muscles results in reflex contraction to restore postural equilibrium. (3) Reduced proprioception is reported in patients with low back pain as compared to control groups. (4) Other related afferent input to the central nervous system include the Golgi tendon organs, joint receptors and mechanoreceptors. (5) Functional aberrations in any of these afferent input systems results in loss of the “positional integrity of cervical articulations” [Fixated-Stuck vertebral motor unit], abnormal movement, and predisposition to chronic spinal injury or degeneration. (6) There are no changes in spindle distribution, morphology, or density for the longus colli or multifidus with increasing age. Consequently, the aged muscle retains its functional afferent spindle capacity despite spinal degenerative changes. (7) Small muscles [like the suboccipital muscles] have large spindle densities, whereas muscle used for gross movement have small spindle density. (8) Muscle spindle afferents from both lumbar and cervical regions terminate in the intermediate zone of the cord [which is where the intermediate lateral column of the sympathetic nervous system lives]. (9) Upper cervical afferent endings project to the inferior olive and cerebellum. Multifidus muscle in this picture is paralleling the spine only the right for educational purposes. These muscle spindles and other mechanical afferent input mechanisms are certainly a component of the fixated vertebral motor unit complex and influenced by chiropractic adjustments/manipulations. This article continues to add to the evidence for chiropractic spinal adjustments affecting the brain (cerebellum) and viscera (intermediate zone). Tissue blocks comprising muscle and bone from C5 to C7 segments were harvested at autopsy from 16 individuals ranging in age from 4 to 77 years. The prevertebral longus colli and postvertebral multifidus muscle pairs from one side in each individual were randomly selected for this study of muscle spindles. To determine muscle spindle distribution, morphology, and density for the longus colli and multifidus in caudal segments of the human cervical spine, and to assess whether changes are evident from infancy to old age. Age-related changes to the osteoligamentous framework of the cervical spine have been well documented. Postural modification accompanies these structural alterations, but there have been limited attempts to document whether muscle sustains a comparable level of morphologic alteration. The longus colli and multifidus were resected between C5 and C7, and between left and right pairs selected randomly for spindle analysis. These vertebral segments were selected deliberately because they form the apex of the cervical lordosis and the site at which the greatest age-related modification occurs. Spindle characteristics were examined using light microscopy and analyzed by unbiased stereologic methods. A one-sample paired t test was used to ascertain whether the differences in spindle density between the two muscles were statistically significant. The longus colli has a high density of muscle spindles, which appear clustered and concentrated anterolaterally, away from the vertebral body. The multifidus has a low density of muscle spindles, which are found predominantly as single units concentrated closely to the vertebral lamina. No change in spindle distribution, morphology, and density were observed with age. The current study examined spindle characteristics for an intrinsic neck muscle pair whose coactivation contributes to segmental stability of the cervical spine. The distribution and morphology of muscle spindles differ between the longus colli and the multifidus. In addition, these muscles have significant differences in terms of mean spindle density. Spindle characteristics represent one of many factors that govern proprioceptive regulation in skeletal muscle, and in neck muscles, the central connectivity of these receptors remains undefined. Therefore, although there are anatomic differences between the neck flexor and extensor, the functional implications of these differences are not clear. Reduced proprioception is reported in patients with low back pain as compared with control groups. Electromyographic studies have established that proprioceptive paraspinal receptor imbalance contributes to the development and progression of idiopathic scoliosis. 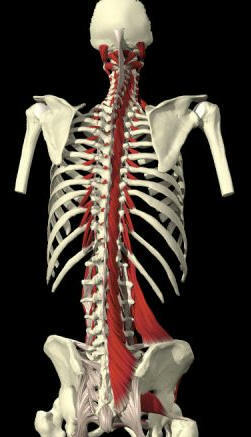 The longus colli maintains cervical lordosis by resisting gravitational force and contraction of dorsal neck muscles. The multifidus contributes to the retention of cervical posture. Spinal degenerative change results in reduced discal height and loss of cervical lordosis. Degeneration is most pronounced at C5-C7 which is the pivot through which movements of the head and neck are mediated. In this study, three spindle receptor characteristics were examined in the longus colli and multifidus: spindle distribution, morphology, and density. In this study of 16 individuals age from 4 to 77 years tissues were harvested within 24 hours. There were no discernible changes in spindle distribution, morphology, or density for either muscle [longus colli or multifidus] with increasing age. The spindle density was determined as the spindle number per gram of wet muscle tissue. The mean spindle number in the multifidus was less than that of the longus colli (111 vs 143). The mean spindle density in the longus colli was determined to be 48.6/g and that of multifidus to be 24.3/g. Muscle spindles in that multifidus are generally are isolated, whereas those in the longus colli appear in aggregates of 2 to 10 spindles. (2) Lumbosacral afferent endings routinely form monosynaptic connections with motoneurons. 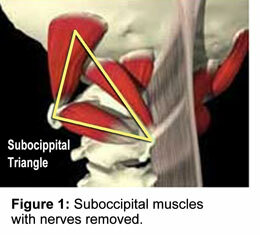 (3) Upper cervical endings also project to the inferior olive and cerebellum. The spindles noted in these two muscles provide sensitive sensory information to control neck posture, lordosis, and movement.